Plus500 is a broker where you can trade CFDs on Forex, Stocks, Commodities, Options and Indices which has been operating for around a decade. The company has managed to earn an excellent reputation for being reliable. 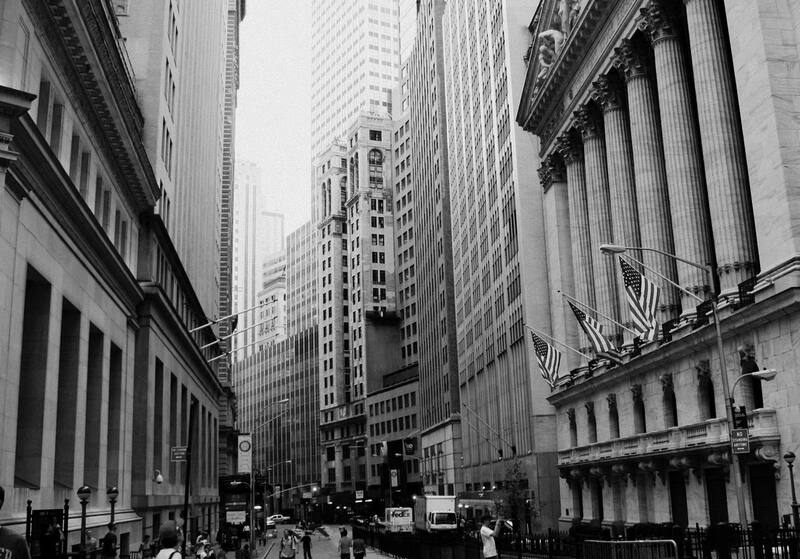 The broker prides itself on being one of the leaders in the industry with innovative trading features. New products and services are introduced fairly regularly to meet the evolving needs of traders. We found that Plus500’s trustworthiness extends much further than just providing services to traders. Plus500 Ltd is listed on the AIM section of the London Stock Exchange. The company also abides by all international trading laws and is currently regulated in three different countries i.e. Australia, UK, and Cyprus. This offers clients an added layer of protection. Traders’ funds are protected via a compensation fund scheme of which Plus500 is a member. According to UK’s financial laws, traders are fully covered under the FSCS or Financial Services Compensation Scheme. The scheme offers coverage of up to £50,000, in the event that Plus500 becomes an insolvent business. The drawback with many online brokers is that they usually have a team of telemarketers who call up traders and demand that they fund an otherwise either dormant or low balance account. The marketers are a hassle because of their relentless approach. The sales team is often aggressive putting clients in a rather uncomfortable position. However, this is something that traders don’t have to worry about with Plus500. The company does not have a sales team calling clients, and no marketers are promoting the service. Plus500 was founded in 2008 and has since then climbed the ladder to rank amongst the best CFD or Contracts for Difference platforms in the industry. The broker deals in Forex, commodities, indices and EFTs. The brand is managed and owned by Plus500 Ltd which is publically listed on the London Stock Exchange. The company was first listed back in 2013, and since then the market capitalization value has topped out at over $1 billion. Plus500 today operates via many subsidiaries which use the company’s branding. Plus500UK Ltd authorized & regulated by the FCA (#509909). Plus500’s goal is to offer clients a 100% secure and safe trading environment along with the ability to trade over 2000 various financial instruments. The vast array of trading platforms ensures that regardless of the type of trader you are there is a platform that suits your style and experience. Plus500 offers traders an array of risk management tools which ensure that traders are protected at all times. Traders have the ability to easily manage their own leverage, and they can trade using either low, high or no leverage if needed or based on their Equity, and Total Position Value which mainly depends on their withdrawal and depositing of funds. Traders can quickly view their Equity and Total Position Value in the Account Snapshot page accessible from the main trading page. Traders also have the ability to set a guaranteed ’Close at Profit’ which is a limiter like ’Close at Loss’, which are instruments that can limit a trader’s overall loss or risk. These features are not offered by all forex brokers, but these are ones that matter the most. Additionally, price alerts and notifications can also be setup so that you’re notified when the price reaches a certain level to buy or sell. The ’Price Alert’ is opposite of a stop because it keeps the position open, making it easier for the trader to decide on the action to take. The bell icon in the Instrument Details screen and the Instrument List page will open the ’Price Alert’ screen when clicked on. Here users can set their preferences. Yet another very useful tool offered is the trailing stop which is a lot like the price limit since they both are used to protect traders’ profits. When a trailing stop is placed on a trade, it will instantly lock profits as soon as the currency pair or a stock reaches a certain new level and not a level at which it was purchased this helps to limit if not eliminate any of the downward risk associated with not being able to monitor the position. 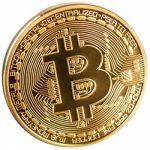 The company happens to be one of the first brokers (with Binatex, Exness, Instaforex, Options Bank and 24option) to offer traders leverage on bitcoin trading which were made available as mainly CFDs in 2013. The bitcoin CFDs provided by the company expire each month. Bitcoin is given the same treatment as any other CFD which can be traded. Plus users can also trade bitcoin via their demo account using virtual money. Plus500 has made sure that their website is accessible in many different languages. Currently, the website is available in 32 languages, and visitors from certain regions of the world are directed automatically to a version of the site in their native language. Though users have the option to also switch the language manually. The goal is to make it easy for traders to use the platform and understand the business. We have to say that one of the best features of Plus500 is their free demo which offers traders unlimited money and time allowing them to practice for as long as they need. Though an unlimited demo is not uncommon, we still think it’s a valuable asset for any newbie trader. Plus500 offers clients a trading platform which gives traders direct access to financial markets via its proprietary set of tools. This is a web-based trading platform, and so it does not require that clients download and install a piece of software. Being instantly accessible means that clients can gain access to their account from anywhere in the world. The platform is user friendly, but meant for experienced traders. The simple user interface makes the platform very easy to use. The screen is divided into three sections with the main menus on the left of the screen. The top half of the screen lists all the trading assets with the lower part showing all the charts. You have the option to choose between a line graph, or candlesticks. The platform also displays all the technical indicators which can be overlayed on the graph to show a much more detailed analysis of currency prices. Traders can also easily adjust the time window of the graph ranging from a minute to a week. In addition to all the above trading features Plus500 also offers a number of trading tools like Close at Profit, Guaranteed Stop, Price Alerts, Close at Loss and Trailing Stop. The price management tools ensure that traders have a way of minimizing risk. Selecting this option will automatically close a trade once the price touches a predefined level of profit. This option enables a trade to be automatically closed when it reaches a certain level of loss. This option sets an absolute limit to how much potential losses you can incur regardless of slippage. This is the tool of choice for traders in highly volatile markets. The price alert will warn traders that the price has now reached a certain level. But unlike the other options mentioned above, it will not automatically close the trade. So, it’s merely a tool which keeps traders informed of the latest developments. 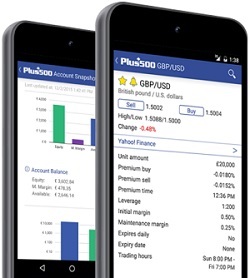 It is important to note that the Plus500 platform is not just available as a web-based trading platform, but it is also for mobile devices. The trading app can be used by traders who want to continue trading on their mobile devices. Plus500 strives to keep things simple and in order to achieve that they offer just two kinds of accounts. The first or basic one is their Standard Account, and the other is a demo account. Opening an account is pretty simple and requires a handful of steps. Just click on the ”Sign Up” link, and you’ll be taken to the account opening page. On the page, you will need to decide between opening a demo account or a real money account. If you have never traded before or would like to get a feel for the platform, then choose the Demo account. Also, new users should select a Demo account because they can always switch the account over to a Real Money account later on. Once you have selected the account type, you will then need to enter your registration details. Fill it out with all the required details and click on the ”Create Account” link. If at any time you need assistance choose the ”Live Chat” option which opens up a window to chat live with a representative. Once you have confirmed all the details entered you can click the ”Create Account” button after which you will be taken to the trading platform. If you want to trade using real money all you need to do is to choose ’Real Money’ in the menu on the left of the screen. When it comes to the selection of a broker, one of the key factors that have to be taken into consideration is the trading cost. Costs can be divided into two categories, commissions, and spreads. For Plus500, there are no commissions involved in any trade. Instead, traders are required to pay a slightly widened spread on the assets that they are trading. Initiating a withdrawal requires following a very similar process to depositing funds. Choose the withdrawal option under the ”Funds Management” link. The usual processing time is around 1-3 business days. Credit Cards usually take around a week depending on your bank and credit card type. eWallets take around a week. Plus500 has 24/7 customer service via email as well as live chat. The WebTrader platform in addition to the proprietary trading platform by Plus500 can be used by traders. However, the proprietary trading platform displays all the relevant information on the screen which makes it easy to understand. The four boldly labeled tabs shown on the screen makes it possible to get details about previous trades as well as all present positions without searching for it. Plus500 has a very good trading platform which is available in 3 different versions. One is a downloadable version, the other is available for mobile devices, and the third is an internet based platform. 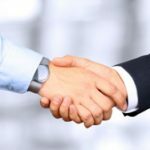 The unique feature of this platform is unlike what is offered by other brokers. The platform remains uniform throughout all versions making it possible to switch between platforms seamlessly. Even though many brokers offer a so called out of the box solution those are limited in many ways. It is for this reason that we are glad to see a reputed broker having built their own unique trading platform unique to their services. Plus500 clients using the platform have direct access to various trading features like guaranteed stop loss, analysis tools, etc. The platform is very reliable and has rapid execution rates which make the platform very impressive. Non-U.S traders will find that Plus500 is an excellent trading platform offering the ability to trade multiple assets. Newbie traders can make use of the demo account to understand the workings of the platform. Seasoned traders can take full advantage of the excellent spreads. 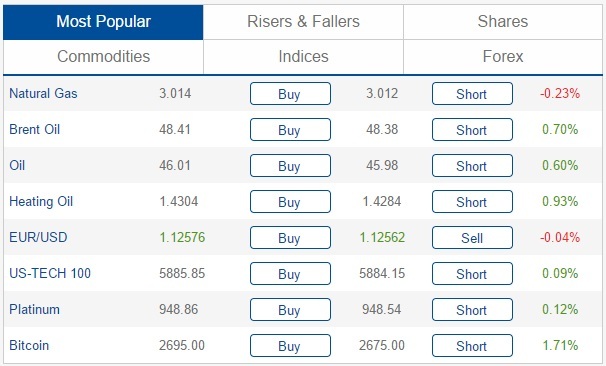 The platform also allows traders to trade in different financial market and all from one screen. In our opinion, Plus500 is an excellent online broker. NOTE: Your capital is at risk. 80.6% of retail investor accounts lose money when trading CFDs with this provider.